ALMOST a good trade! I remember Dr. Pipslow talking about how not all losing trades are bad trades. In this case, the trade would’ve been a good losing trade if not for a newbie mistake. D’oh! In my original trade idea, I mentioned that I entered at market on a possible shallow retracement. Unfortunately for my trade, the euro bulls found support at around my entry level. Heck, price had even missed my original stop loss by 1 PIP! 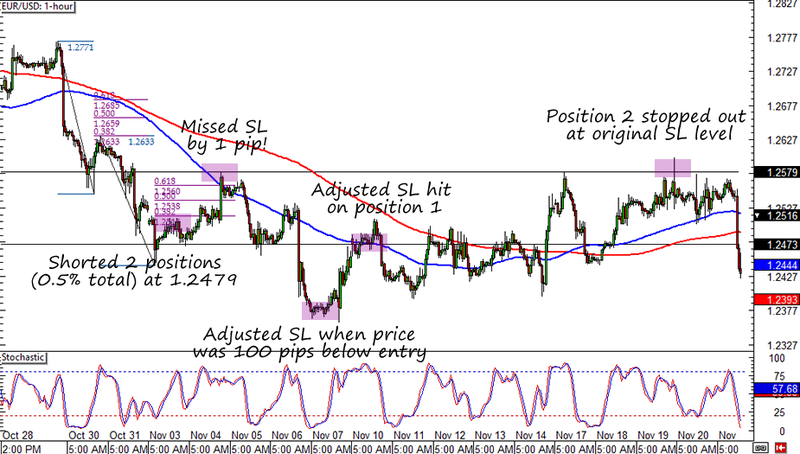 Imagine my relief when EUR/USD fell to 100 pips below my entry level and I had a chance to manually adjust my stop loss. Unfortunately, I made a newbie mistake of not being thorough with my positions. You see, I broke my 0.5% risk to two 0.25% positions. As it turned out, I was only able to adjust the stop loss on one 0.25% position. D’oh! A couple of things I could have done better. For one thing, I could have closed the position as soon as I saw that EUR/USD had stopped (or at least paused) its downtrend. I could have also been more patient and waited for a better entry level. Last but not the least, I could have double checked my positions, especially since I’m making changes.